English language learners can be found in almost every public school across America. There are many different programs and models for these students to learn and acquire their new language of instruction. If there is a freestanding ESL (English as a second language) program at the school, then the English teacher has implemented either push-in, pull-out, or even a combination of the two. Both have their advantages and disadvantages. In my years of teaching, I’ve used both models and have seen first hand the effects each can have on the students. 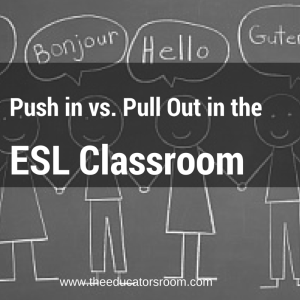 Push-in is when the English teacher comes into the general education classroom and aids the English language learners (ELLs). There are some general education teachers that absolutely welcome another teacher into the room and see it as a positive experience. Other teachers don’t view push in as such a positive instructional strategy. Instead, they see it as intrusive and would prefer the classroom to themselves. How the classroom teacher feels can change the entire tone of the push-in period. If the ESL teacher is viewed as a valuable resource that is there to help the children, it can be a very productive period. If the ESL teacher is viewed as a paraprofessional that is secondary to the classroom teacher, then friction between the two teachers can occur and the students are the ones that are being hurt. There needs to be a mutual respect between the teacher for push-in to be the model of choice. There is also very little time to co-plan when using the push-in model. Often it works out that the ESL teacher is walking in blind. It’s impossible for a service provider such as an ESL teacher to have the same common prep as every grade level. This lack of available planning time can make push-in less effective than it could be. Personally, I don’t see push-in as the best option available for newcomer and beginner students that have recently arrived in the country. The ESL teacher is able to focus on basic language skills in the pull-out setting that is not an option during in-class instruction. Advanced students can benefit greatly from push-in as the ESL teacher can provide differentiated instruction during class time. Pull-out requires that students miss class time. ESL teachers using this model often hear about it from the classroom teacher. There can be complaints about the students missing anything from a literacy period or a test. The classroom teacher needs to remember that the ESL teacher can only be so flexible. When there are so many students with varying needs it can be hard to switch a student into another group at a moment’s notice. The groups are done according to language level and it does not make sense to switch a newcomer into an advanced level group, or vice versa, in order to accommodate the classroom teacher in that moment. There are also mandated minutes for the ELLs that vary according to the state. In New York the minutes vary by language level; beginner and intermediate students receive 360 minutes a week and advanced students receive 180 minutes. Getting those minutes into one week can be daunting. This is also a lot of class time to miss. The pull-out method allows the students to receive more individualized attention in small groups. The ESL teacher arranges the groups according to language level so that he or she may provide the appropriate amount of rigor in each lesson. The newcomer students may work on everyday vocabulary and phonics, while the more advanced students work on grade level appropriate strategies and skills. Though the students miss class time, the ESL teacher is able to provide more intense, individualized attention with a language focus. There is also no need for co-planning. The ESL teacher provides support that aligns to the state curriculum, but does not work directly with the classroom teacher. Even then communication between the two teachers is key for student success. No matter what the model used at your school, if you are the classroom teacher please be mindful of what the ESL teacher is trying to accomplish with the ELL students and be willing to work with them for the benefit of the students. Now what has been your experience with the pull out and push in method with ELL students? I would only add, that, theoretically anyway, any method has the ability to work as long as adults are on the same page. Children are quite sensitive, as you imply, so if they pick up on the fact that adults are not working together, they react to that and the good intention may well be lost, to some extent. I think it’s very easy for us to get lost in our ‘ideal’ way of doing things. Kids on the whole need to know that we like being with them, regardless of the finer points of educational theory. We need to embrace the idea that push-in/pull-out does not have comply with a geographic notion: as long as we are “pushing in” to the same curriculum the classroom is engaged in, we can engage in excellent instruction and learning in a small group setting outside of the classroom. As a paraprofessional, I find that principals think we need someone looking over our shoulders at all times–we simply cannot be trusted without someone watching our every move. It is demeaning and ridiculous.